Weaving the stories of three German families from the beginning of Germany’s territorial aspirations of the First World War to the shattered dream of a thousand-year Reich in the Second World War, Tim Heath’s rich narrative explores a multitude of rare and untapped resources to explore the darkest recesses of German social and military history. Hitler’s Germany presents a nation’s journey not only through everyday life and war, but through its own conscience, pain, and inevitable search for some form of absolution from its past. 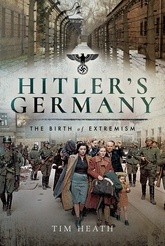 It is real, painful, and incredibly human—an essential history to further understand the mind-set of Germany during the most tumultuous years of the nation’s history.